The flight was very nice. I have flown from NYC to Asia many times. This is the first time the flight has been direct. This added an excellent level of comfort to the trip. The meals and staff were excellent. 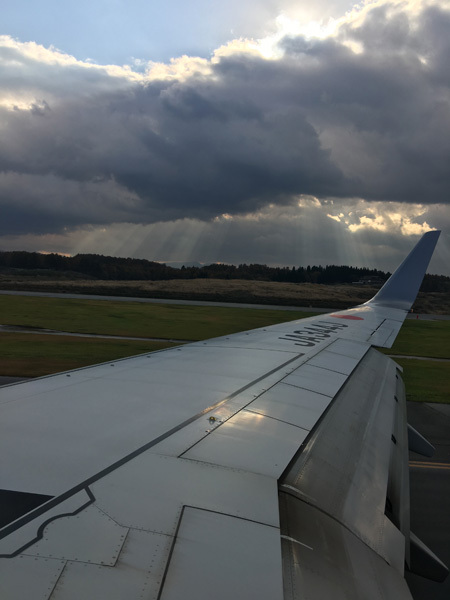 I felt very comfortable on the flight, and the fact that it was a straight flight let me sleep undisturbed the entire way which made it easy to deal with jet lag. 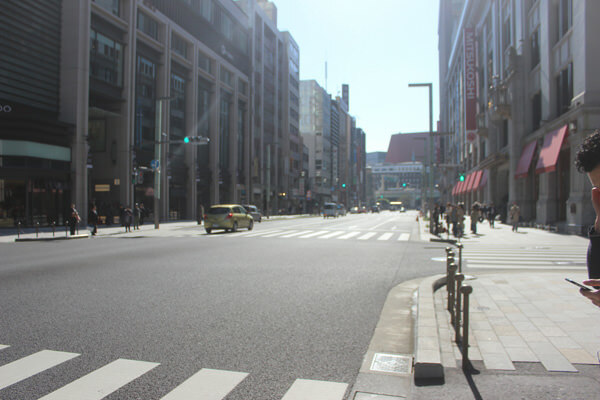 Ginza is an excellent part of Tokyo. 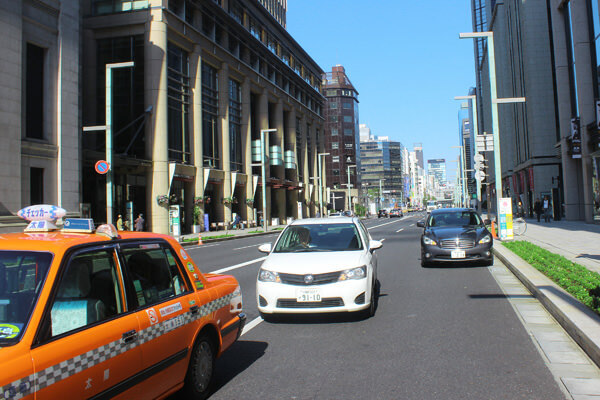 It is stunningly clean, and there are a lot of shops to see and explore. The tour guide was very helpful and taught us the history of the buildings and area of the city. 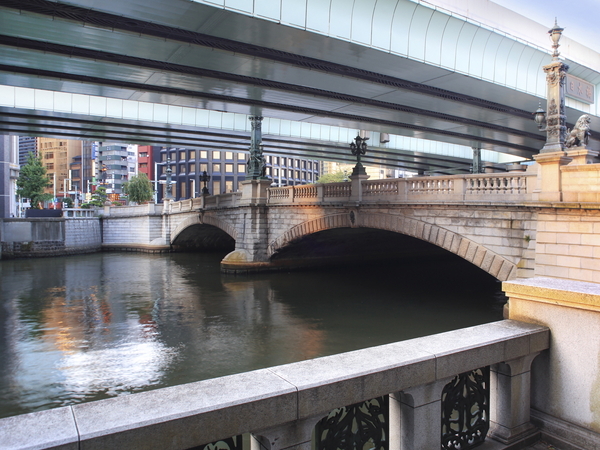 My favorite part of our stroll around Nihonbashi was learning the history of the bridge. 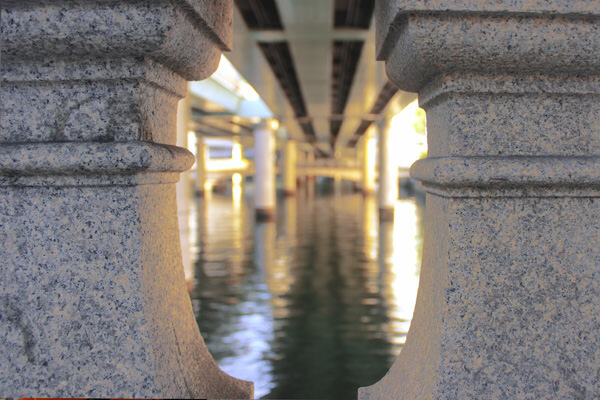 I found learning about why the bridge was built, where the statues came from, and the fact that it is straight on National Route 1 very interesting. I enjoyed the afternoon learning how to do some basic Origami. The teacher was very good, and I found the class easy to work with. I think this would be fantastic things for visitors to check out in this area, and they will have a lot of fun with it. 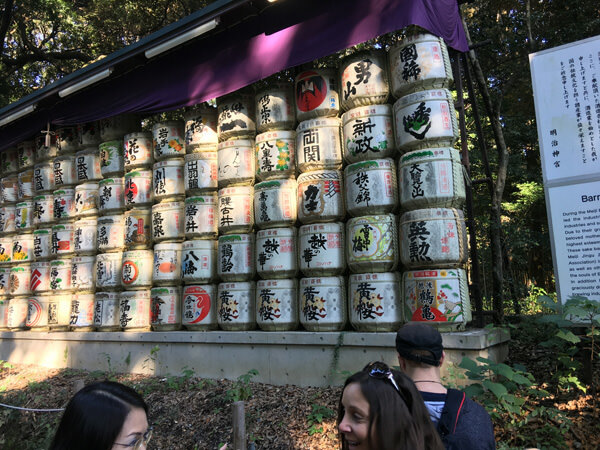 This is an activity that I would recommend to anyone traveling Tokyo and around this area. 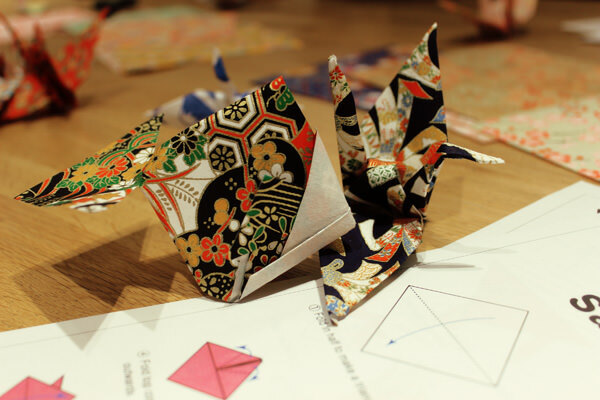 I think many visitors would find the Origami lesson very fun. 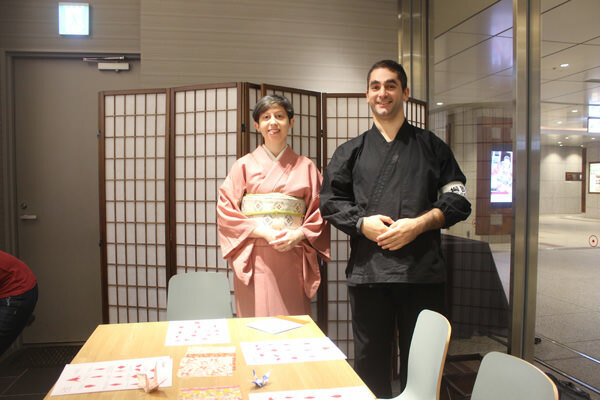 We were treated with the utmost respect and honored guest at restaurants like Hounenmanpuku. The food presentation at the meal was very beautiful, and the food was delicious. 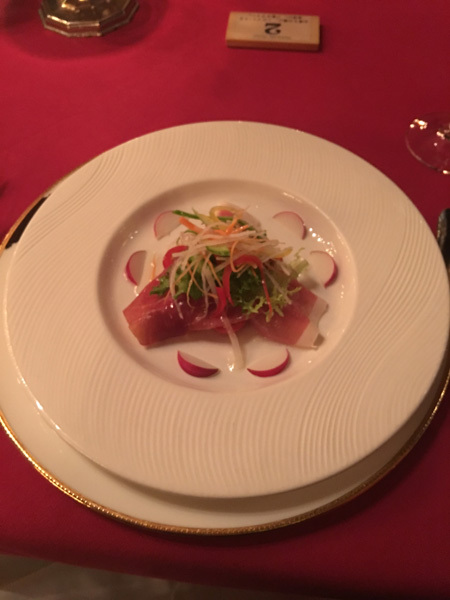 The food in Japan was some of the best food I have ever had while traveling. Full of history and some of the best shopping experiences in Tokyo, Ginza is a must-see for any tourist interested in experiencing the height of Japanese fashion and retail. Fans of the local cuisine will find a treasure trove of treats waiting for them in the basement of any of the large department stores in the area, which feature a seemingly limitless selection of fruits, meats, salads, desserts and just about any type of Japanese food you can think of, all sourced from only the best providers. Nihonbashi is a commercial and shopping center in Tokyo that also is home to the starting point of National Route 4, which spans over 700 kilometers and ends at Aomori, our next day's destination.We had a chance to stop by the Nihonbashi Dashi Bar and try some of their "stock," which was delicious. Experiencing an origami lesson under the tutelage of an Italian instructor at Coredo was enlightening. I had not expected to be able to complete my crane but not only did the teacher prove me wrong, she also encouraged me to continue on to create two samurai helmets as well. Hounenmanpuku, our lunch destination, was a nice place to take a break along the Nihonbashi river. 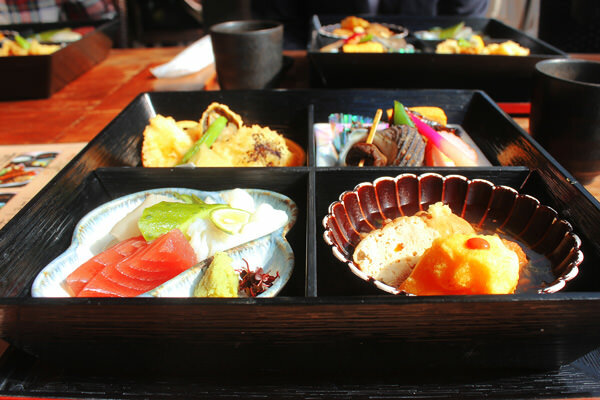 Our "Shoukadou" lunch bento contained four sections, each filled with a different type of delicious seasonal food, including sashimi, tempura, oden, and assorted shellfish. I loved walking around the gardens of the Meiji Shrine. 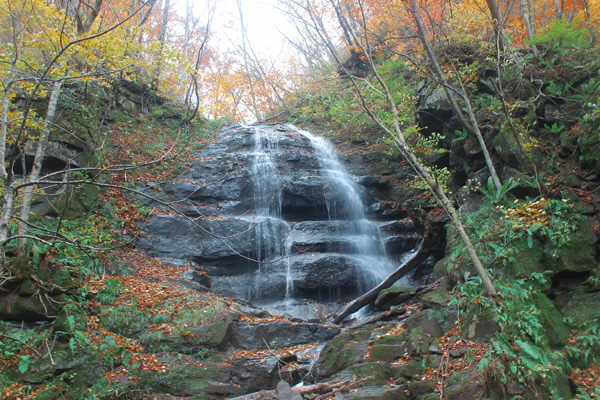 It is a breathtaking and peaceful place to walk around. 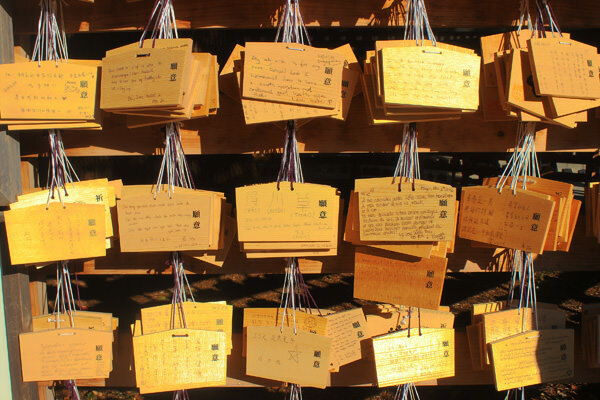 We walked around the shrine and I got to fill out my first Ema after paying respect to Emperor Meiji. I really liked this shrine and would visit it again. 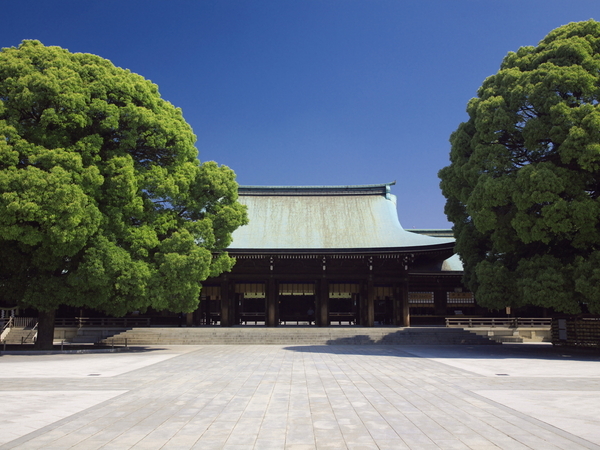 The Meiji Shrine is the top tourist destination in Tokyo and rightfully so, being the site of perhaps the world's largest urban man-made forest. 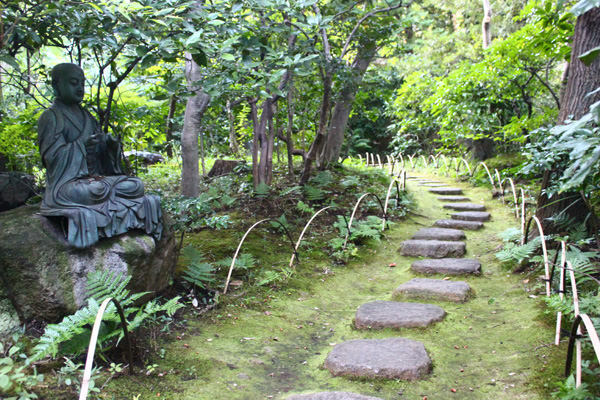 My favorite things about the NEZU MUSEUM where the lush green, gardens, wooden bridges, and tea houses in the back. I spent most of my time here wandering outside enjoying the beautiful walkways. The Museum itself was interesting and held some great drawings. I sat looking at them for a good 15 minutes taking in the entire area. The Nezu Museum is a must-stop for any serious fan of Japanese art.We wound up spending our time in the Museum garden, which was a wonderful way to enjoy the brisk Autumn weather. Dinner at Teyan-tei was one of my favorite meals of the trip. I loved sitting in the private room with everyone. 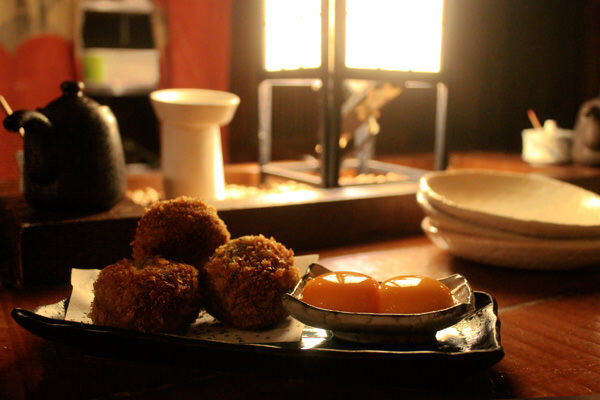 The potato balls were very delicious, and slightly sweet, which was a nice surprise. All the food was well prepared. I really liked this restaurant and to me, it felt like a traditional Japanese restaurant. 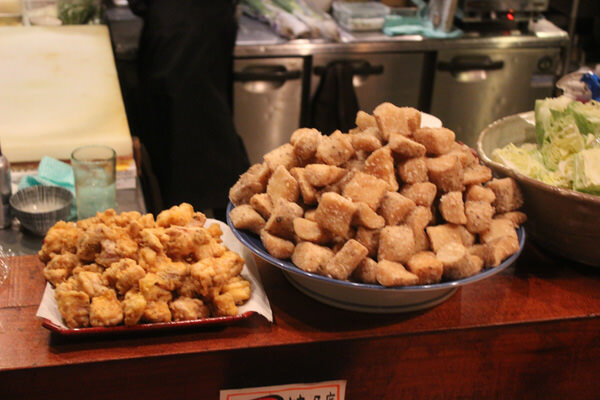 Swanky neighborhood Nishi-Azabu is where our dinner destination, Teyan-tei, was located. 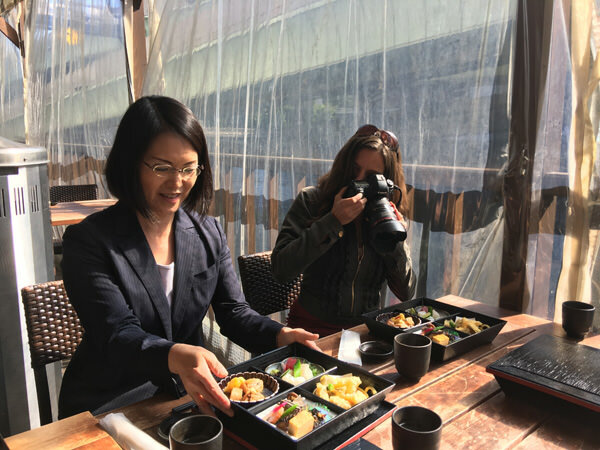 A wonderful opportunity to introduce our tour guide's to the wonders of yakitori shish kebab, the restaurant boasted an impressive collection of chicken and regional varieties of sake. 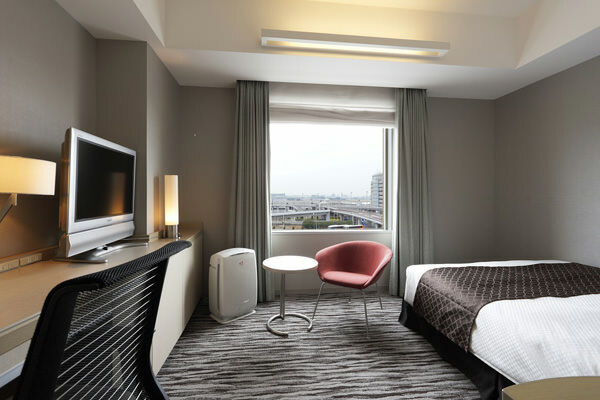 The Haneda Excel Hotel was the perfect choice because of the early morning flight. 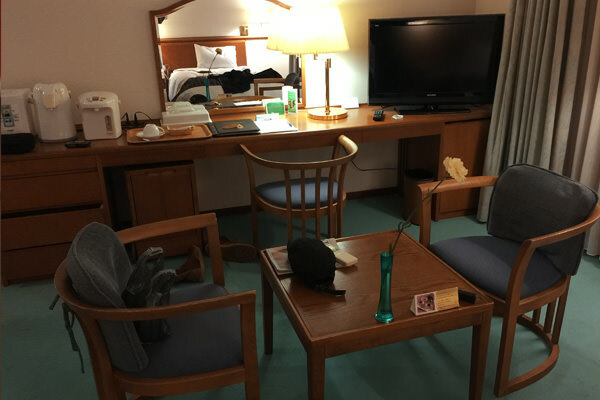 It let us get more rest and be prepared for when arriving Aomori. The rooms were immaculate and had lots of outlets. It has fast wifi, and the breakfast was delicious. The hotel offered both Japanese and English style breakfast. I liked that I had this choice. 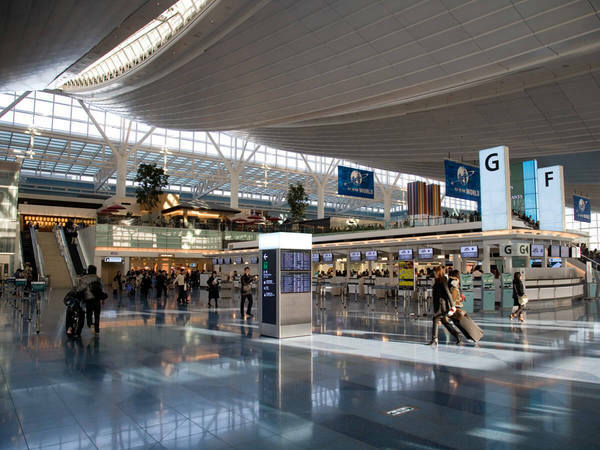 For those who have recently arrived via Haneda Airport or who are about to take a morning flight, the Haneda Excel Tokyu is literally the most convenient hotel you can stay in, given its location some 5 meters from the check-in counter. Make sure you get a room with a view of the runways. It's quite a sight to wake up to! The flight was on time and comfortable. The guide was excellent at getting us on the plane on time, and dealing with our bags. The flight was smooth and went by quickly. 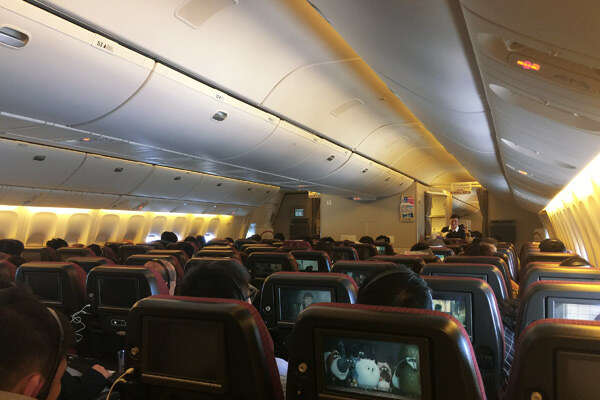 As usual Japan Airlines (JAL) was comfortable, had excellent service and was 100% on time. I have never been disappointed with a domestic carrier in this country and was not surprised to be extremely well taken care of. 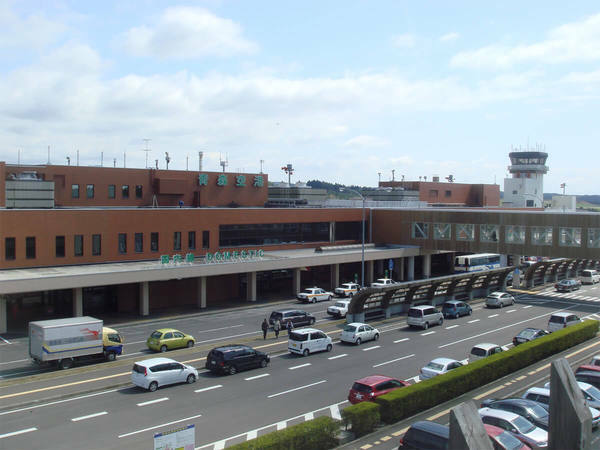 Those flying JAL (or ANA) to Aomori who are interested in bicycling around the area may be interested to know that the airlines will accept bicycles as check-in luggage for no additional charge, provided the front wheel of the bike is removed from the frame and both are contained within an opaque bag. Wa Rasse was a major highlight of my trip to Japan. I knew nothing about Nebuta before visiting this museum. I found the entire festival breathtaking. The time and dedication that goes into making these incredible float in mind boggling. I loved learning about this wonderful festival, and I plan on visiting the Nebuta festival in the next couple years. I think this type of festival is something that tourist from all over the world would love. I can't wait to show it to them. The think the personal hotpot for this meal was a perfect idea. The meat and fish were delicious and top quality. 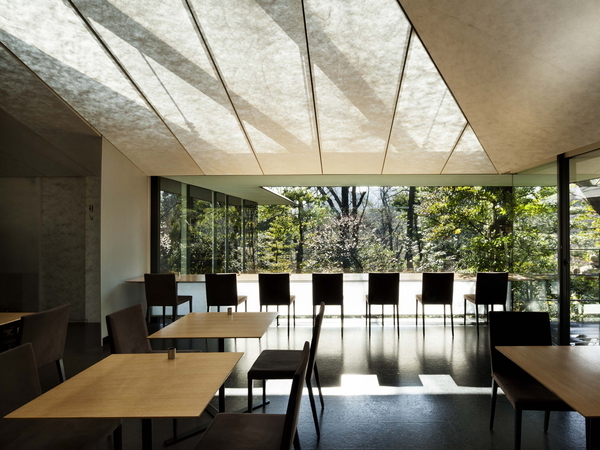 The restaurant and atmosphere of Hakkoda was lovely. It has a winter resort fell to it. 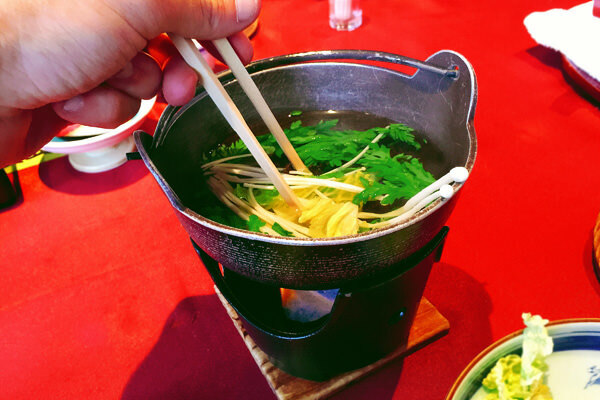 It was very fun to cook my own food in the hotpot. I ate so much I could not have eaten more. It was a fantastic meal. Our first stop in Aomori, Warasse is a building devoted to celebration of the Nebuta Festival, the largest event in Aomori. 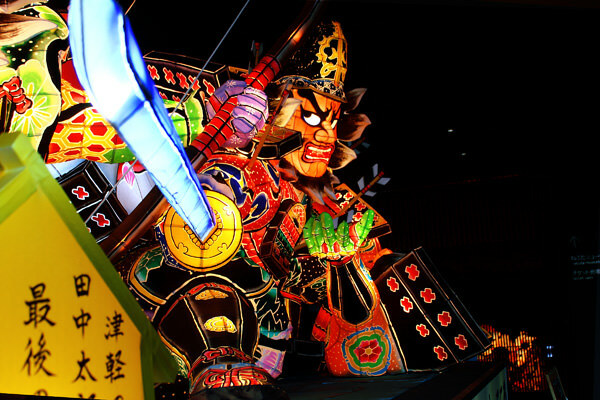 Taking place every year from August 2-7, the parade of intrically designed illuminated floats attracts over 3 million people annually, which is more than double the population of the entire prefecture! The name of the facility is derived from the exclamation shouted out by those who participate in the parade. 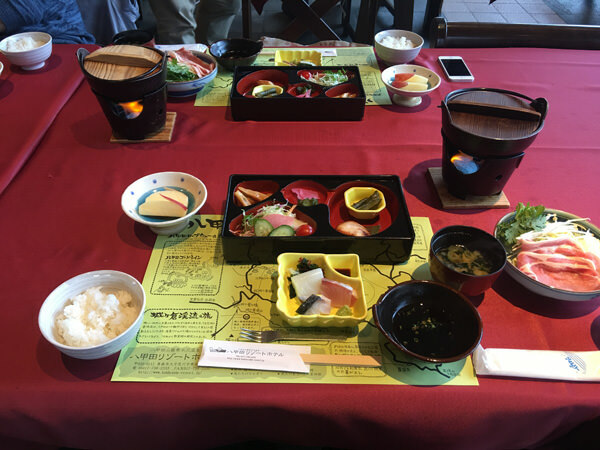 For lunch we had a delicious bento with a view of some of Aomori's ski slopes popular with Australian tourists. Although the November weather wasn't quite cold enough for snow, we did get a chance to see some gorgeous views of the multi-color tree scape. Sadly, the ropeway was closed due to the weather. But we talked to the owner and he should tell us pictures of Aomori all throughout the year. I will say that this area of Japan is absolutely beautiful. I am glad I visited in the fall, but I would like to come back and visit it all year round. The area is just stunning. 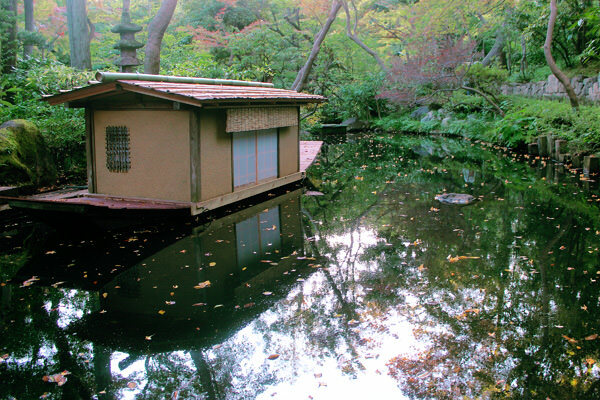 The Hiba Sennin Buro is a large, communal bath that is as big as 160 tatami mats. It was made entirely from hiba arborvitae wood, without a single support pillar, and it is famous throughout Sukayu Onsen. Consideration was given to installing screens and it features women-only bathing times, so it can be readily enjoyed by people that are new to mixed bathing. Onsen hot springs is a lovely resort. It has a vibrant atmosphere. My hot springs experience was lovely. 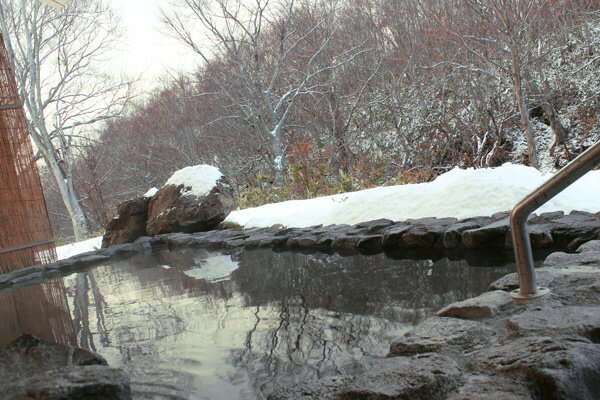 I spent some time outdoors fighting the cold with the warm water of the hot springs. This was one of the most memorable parts of the entire trip. I would love to return to the hot springs. 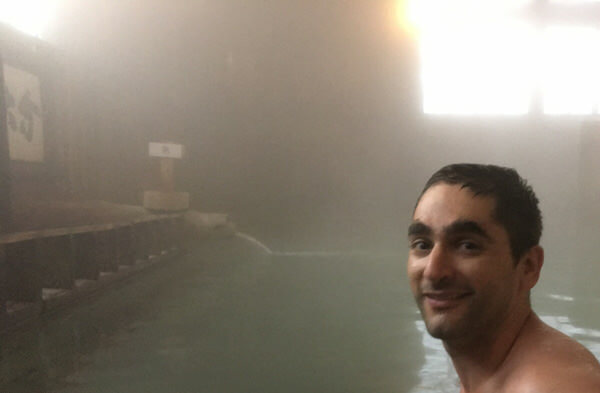 Having lived in Japan for 10 years, I've experienced my fair share of onsen (hot springs) but nothing like the sulfur infused waters of Sukayu. 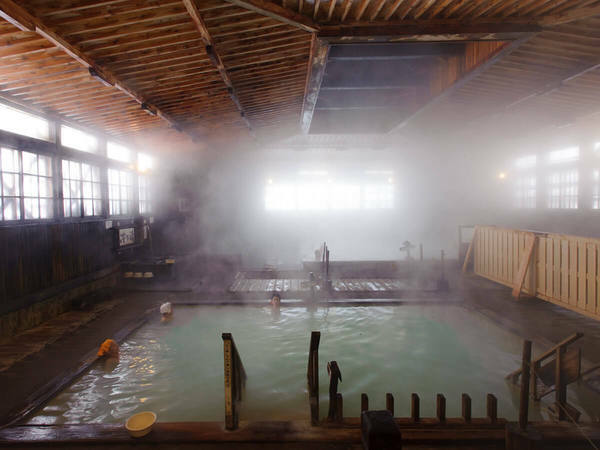 While a dip in most onsen will be good enough to heat you up for the time being, an hour in sukayu's special blend will make your body feel toasty all the way until the next morning. I don't really understand it (apparently it has something to do with sulfur) but anyone who wants to experience the cold weather without ever actually feeling cold would do well to drop by. 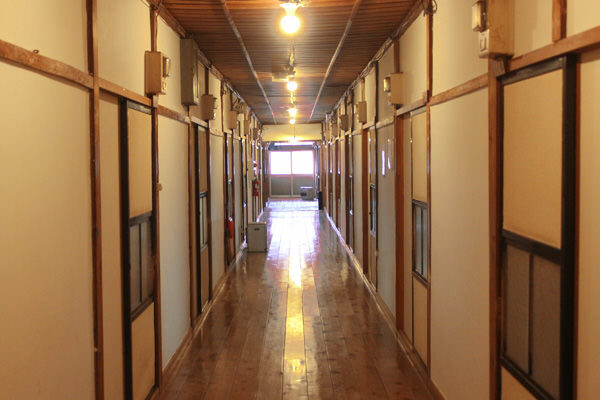 The facility also offers an interesting range of accommodation options, including shared kitchens with running mountain water. Also of note is that the Sukayu baths are mixed-gender;, although there are separate sections for men and women, both bathe in the same large tub." The hotel was large and clean. It was very warm which was perfect since Aomori was getting cold at night. The atmosphere was friendly, and there had a nice hot springs in the hotel that Mr. Benjamin and I visited it. Hakkoda Hotel, where we stayed for our one night in Aomori, is a spacious hotel with impressive dining and event facilities. The dinner and breakfast we had there were delicious and took place in a dining room with a great view of the surrounding Autumn foliage. The communal bathing facilities, although not as unique as those at Sukayu, were a wonderful place to finish the evening. Flowing approximately 14 kilometers from Nenokuchi on Lake Towada to Yakeyama, Oisrase Stream has lush trees and several waterfalls, and the charming ever-changing flow, oddly shaped rocks, and beauty spots give rise to magnificent mountain stream scenery, allowing you to thoroughly enjoy the beauty of nature in all four seasons. 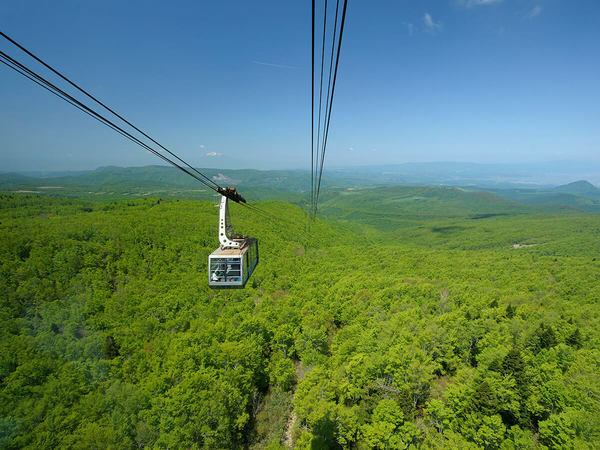 Fresh greenery is visible from May to June, and the fall leaves start to change color in early October and are at their best from mid to late October. Even though it was a little rainy, the hike was worth it. 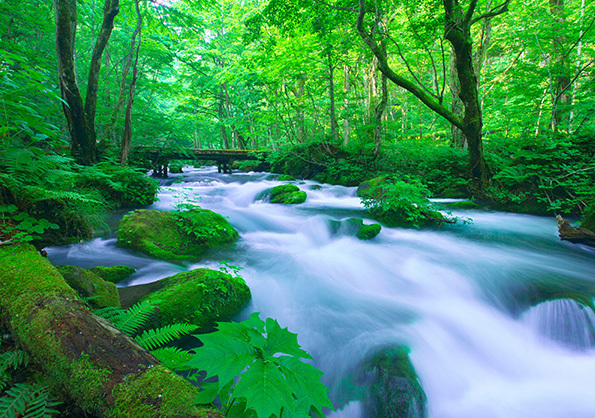 The rain even added to the beauty of Oirase Keiryu. The levels were a lovely display of different colors. Nature and hike were nice and relaxing. This area is so beautiful that I think it there was an activity like an apple festival that tourist would flock to Aomori for the festival and the beautiful landscape. Overall, Aomori has insane amount of beauty and nice people. I would enjoy coming back to this trail and do some more hiking. Our hike along the Oirase River was the highlight of the trip. 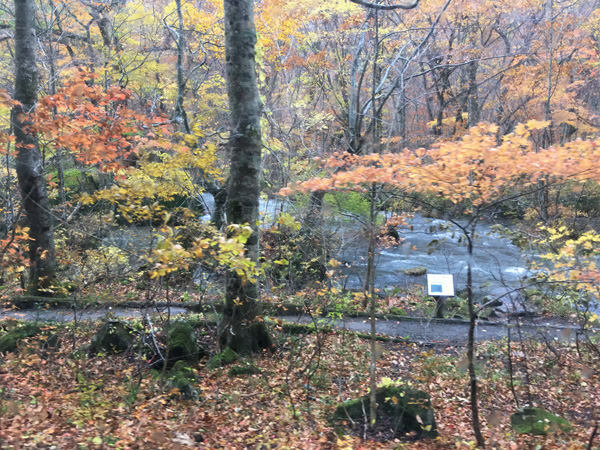 Far from the crowds of Tokyo and even Aomori City, our hour-long hike through spectacular Fall foliage brought us past a number of beautiful waterfalls that were a sight to behold. Tourists would do well to start their hikes even earlier than we did, at the beginning of the 9-kilometer trail, for the full experience. 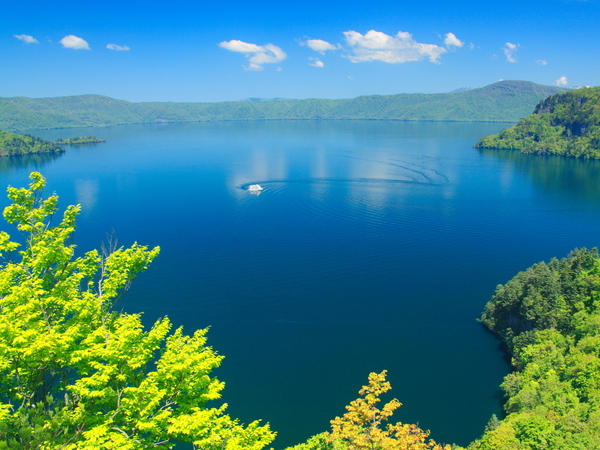 With its beautiful lake that is like a mirror reflecting the sky and mountains, as well as its open and vast panoramas that take one's breath away, Lake Towada is famous for its fresh greenery and autumn foliage. As such, it receives numerous visitors who come to fully enjoy the four seasons there. 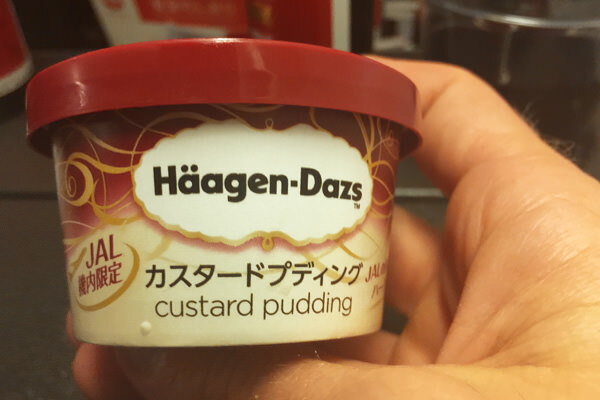 This was perhaps my favorite meal in Japan. The beef and onions had a lot of flavors, and the dish tasted so good that I ate every single bite. I would happily eat this meal many more times. This is also a meal that I think many westerners would enjoy. For desert, Mr. Benjamin and I had a delicious apple pie. Aomori has the best apples in the world. I had a light dinner because I was still full from Towada Barayaki. The scallops I did have were excellent. I loved fishing for them even though I did not catch any. 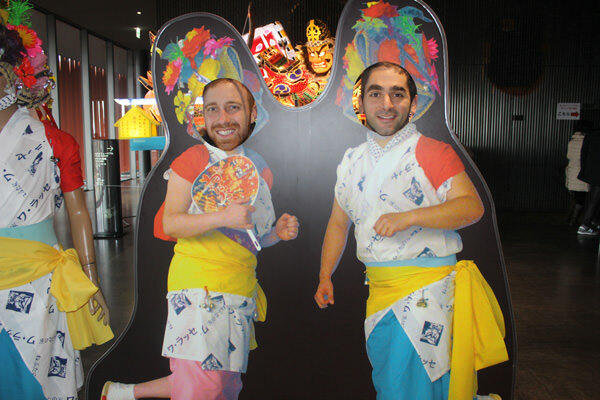 Our final lunch in Aomori was at Towada-Barayaki, and it was an exciting one since we all had a role to play. 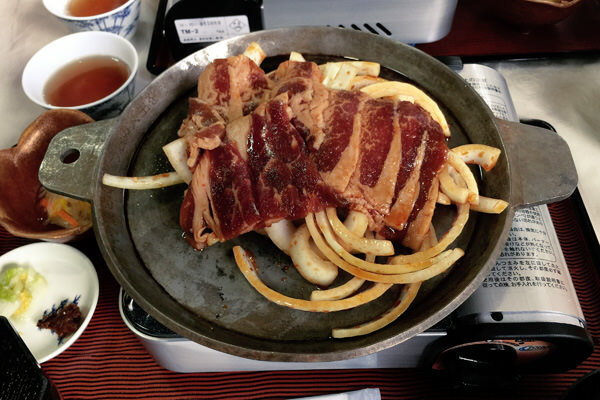 Barayaki, or rib meat with green onions and sauce, is a speciality of the prefecture and each of us received a small personal hot plate to cook it on. 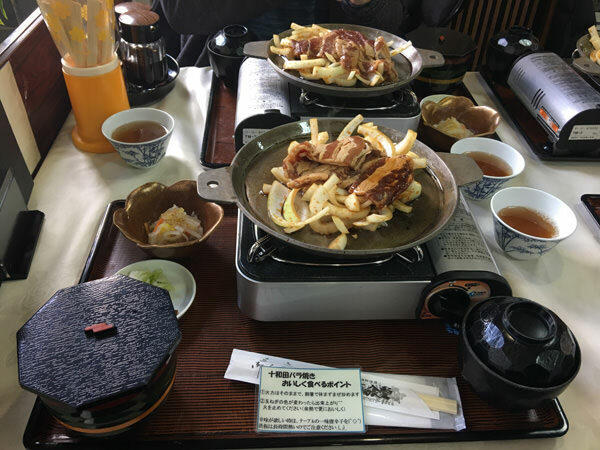 The restaurant is located a short distance from Otome no Zo, a famous bronze statue that is very popular with domestic tourists. While those travelling abroad may not be excited to see sculptor Kotaru Takamura's final piece of art, the short trip to the statue goes along a very pretty part of Lake Towada. We made the moss ball as an alternative of the Lake Towada excursio on boat. The Oirase Stream Museum (an odd name given the Oirase River's size) is a great destination for families looking to learn more about the area. 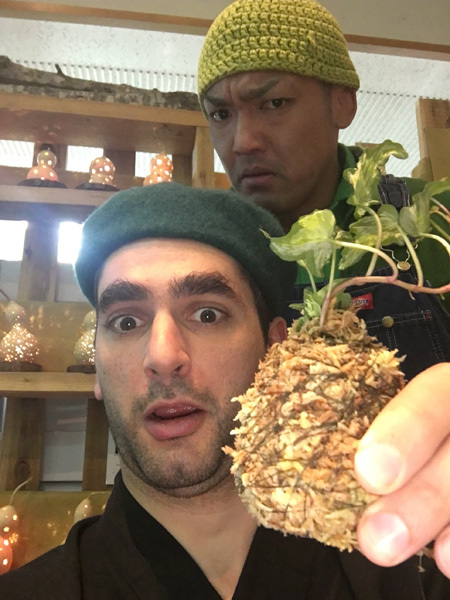 Its main draw is the Kokedama (Moss Ball) Making class, led by a former professional wrestler who certainly knows his stuff. 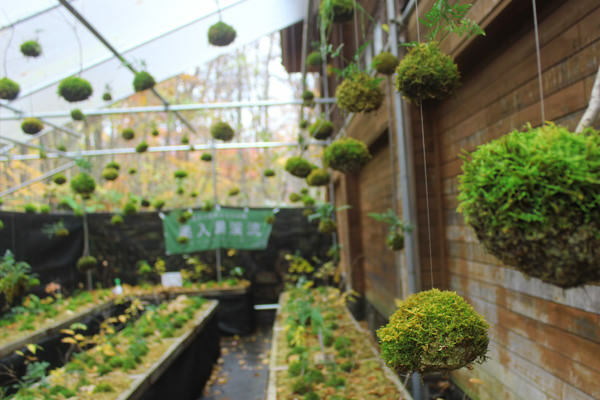 Travelers should be advised that moss balls are alive and probably will not clear international customs, but make a great gift for any Japanese friends. 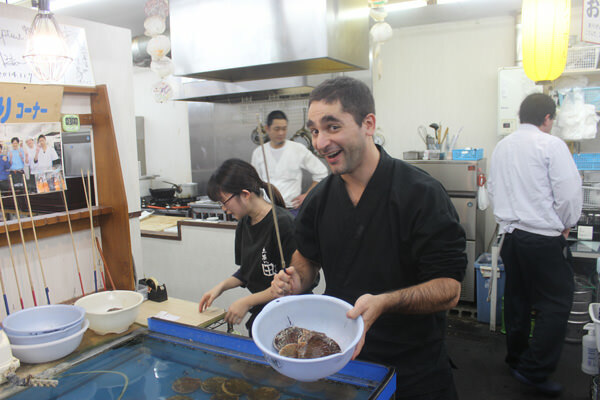 Hotate Goya offers a dining experience that may very well be unique to Aomori: Customers are given the chance to fish for the very scallops they will be dining upon. For a 500 yen entrance fee, you are given a fishing pole and three minutes to catch all of the scallops you can within the time limit. Anything you catch is then prepared for you as sushi, sashimi or grilled style. This tour was very well planned, and executed. We went to great hotels, restaurants, and fun sites. 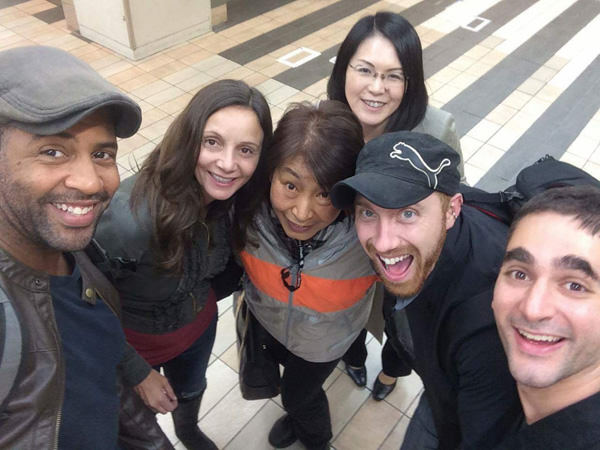 This tour was a great introduction to Japan and makes me want to explore the country more. 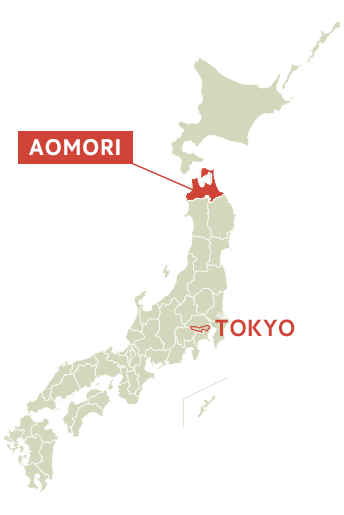 Aomori is a wonderful place to experience Japan's bountiful nature as well as some of the most delicious apples you'll ever find. Visit during the Nebuta Festival to experience something truly unique and if you'll miss it (or want to miss the crowds on purpose), take a look at its fantastic parade floats at Wa rasse, the Aomori museum dedicated to it.